Coin Legends - What is the Legend on a Coin? 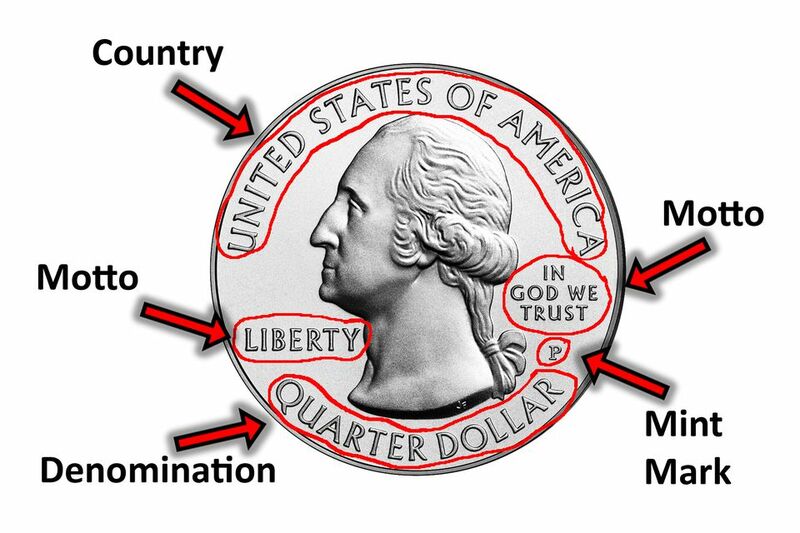 Parts of a Coin: Legend, Motto, Denomination, Mint Mark, Country. Image Copyright: © 2016 James Bucki; All rights reserved. The legend is the inscription on a coin that conveys information about which country minted it and for what purpose. On regular issue coinage, the legend tells us the nation that minted it, and perhaps the denomination. On U.S. coinage, the legends include United States of America, the denomination, and the date. The legend on commemorative coins describe who or what the coin honors. The legend shouldn't be confused with the motto. Why Are There Legends on Coins? Although the answer varies from country to country, there are some commonalities between coins that are issued in different countries. One of the first and most common reason is to identify the issuing country. This basic information will help when it comes to international transactions. Today international trade is accomplished through modern banking transactions. But in the not-too-distant past, gold coins and silver coins with the workhorse of international trade. The second most common type of legend found on a coin is the denomination. As early as the late 1700s, the United States coins did not carry a legend that identified the coin's denomination. Since most people in America at that time could not read, they knew the coin's denomination by its composition (gold, silver, copper, etc.) and its size. Today a coin's denomination is an integral part of its design. Over time coins have also been used to commemorate special events, people and places, among other things. Legends on the coin identify what is being commemorated via the coins design. Countries in ancient times used coins to influence foreign perceptions of their country. For example, a lion or other beast was placed on a coin to signify a country's strength or military might. In modern times coins have been used to commemorate the bicentennial of the birth of the United States, a special event such as the Civil Rights Act of 1964 or many of the presidents as commemorated on the Presidential Dollar series coins. Legends are most commonly found on the obverse or reverse of the coin that contains the design. Sometimes, a legend is found on the edge of a coin that is also known as the "third side of a coin." The most recent use of a legend on the edge of a coin can be found on the 2016 American Silver Eagle 30th Anniversary coin. I am glad Japan puts decimal digits on its money, because I can't read the legends written in Japanese characters!